Troop 50 Scouts, leaders, and families gathered for more than the presentation of merit badges and ranks, and the installation of new youth leaders at the troop's June 1 court of honor. The 2015 spring court of honor marked the inaugural presentation of a new troop award recognizing the achievements of its "honor Scout" and paying tribute to the legacy of an Eagle Scout with several ties to Troop 50.
and nearly 30 merit badges. Following an opening by Senior Patrol Leader Andrew and a lavish dinner spread provided in large part through the culinary talents of troop parents, the official awards program began with the presentation of merit badges. Many of these merit badges resulted from Scouts' participation in the December 2013 Saugahatchee District Advance-a-Rama, the troop's Disability Awareness Merit Badge session at its April 27 meeting, and a variety of merit badges begun at summer camp or during the troop's other outdoor activities. In addition to merit badge presentations, the troop presented the First Class rank to nine of its Scouts, and recognized its newest Scouts who received the Scout rank at a previous meeting. Michael, assistant patrol leader; and Clay, quartermaster. Not pictured is Liam, troop guide. The spring court of honor traditionally includes the mid-year transition of youth leadership, so in addition to recognizing SPL Andrew's second term in the position (he served as the troop's second senior patrol leader during the latter half of 2013), the troop installed recently elected and selected youth leaders who will serve in their positions until the end of the year. Scoutmaster Baird introduced Louie who had been elected as the troop's new senior patrol leader, and outgoing SPL Andrew who Louie selected as his assistant senior patrol leader. During the troop's recent elections, Creighton and Nicky had been elected as patrol leaders, and they selected Josh and Michael, respectively, as their assistant patrol leaders. Troop leadership selected Clay as the troop's incoming quartermaster and Liam as its troop guide. 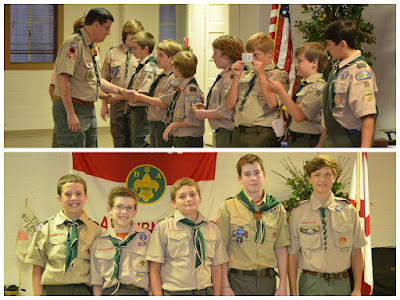 Troop 50's inaugural James J. Baird Jr. Honor Scout Award recipient, Andrew, with Jim Baird's wife Jean, daughter Mary Baird, and nephew and Troop 50 Scoutmaster Andrew Baird. then-Chief Scout Executive Elbert Fretwell. The final presentation of the evening was the troop's inaugural presentation of the James J. Baird Jr. Honor Scout Award, which was awarded to outgoing SPL Andrew. Beginning with the spring 2015 court of honor, this award will be given annually to the troop's "top Scout" based on his participation in troop activities, demonstration of Scout skills, continuing advancement success, and a vote of his peers. The award honors the memory of Jim Baird, the uncle of Scoutmaster Andrew Baird and recipient of the Eagle Scout rank in 1945 as a member of Troop 88 of Bessemer, Ala., who passed away in 2011. A 1954 graduate of Alabama Polytechnic Institute (now known as Auburn University), Jim Baird's ties to Troop 50 include membership in the Auburn Rotary Club (the troop's chartered organization) as a Paul Harris Fellow and service as its 2002-03 club president. Furthermore, he was an elder of First Presbyterian Church (the troop's meeting location), which honored him through the naming of Baird Hall in recognition of his management of the church's facilities and several building projects. The court of honor will be the troop's last official Monday evening gathering until the troop resumes its regular meeting schedule on August 3. Between now and then, the troop will venture to Camp Sequoyah next week and gather periodically during the summer for a variety of fellowship and advancement activities. Consult the troop calendar and Troop Web Host for more details. For more photos from the court of honor, visit the troop's online photo album.